How To Go Chocolate Buying & Not Gain 5 Lbs! Posted on July 5, 2016 at 11:15 pm. So….made you look, huh?!?! Well, what I’m really talking about chocolate buying as a buyer for a store, walking a convention center filled with option-upon-option of the tasty stuff from all over the world. 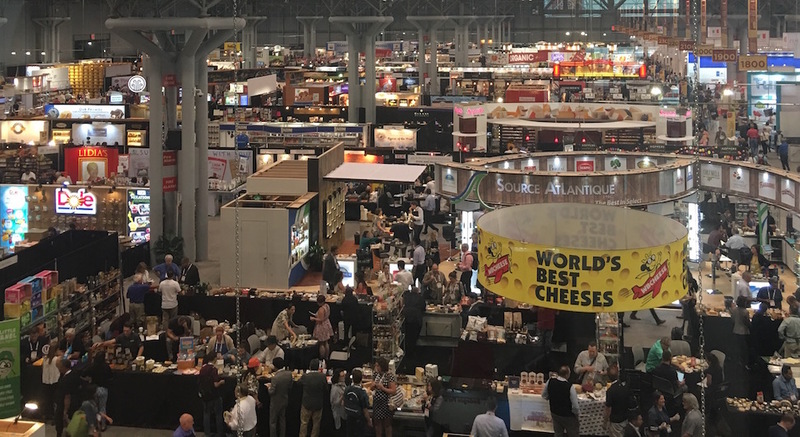 I just returned home from the Fancy Food Show in NYC where, I’m happy to report, I found some delicious new selections that will soon be on our shelves. I’ve been shopping this show ever since we open the store, and I don’t know that I ever seen it this crowded. When I first started going to the show, I was overwhelmed by all of the choices – not just the chocolate that I was shopping for, but all of the choices in so many categories of food – crackers, cookies, cheese, pastas, yogurts, – I could go on and on and on. During the recession, there’s no doubt that attendance at the show dropped off – both in terms of attendees looking for new products, but also exhibiting vendors. Well, this year it certainly seems to me that we’re back at it and we’ve hit our stride again, because this show absolutely wiped me out! Of course, there was a lot of chocolate tasting going on – after all, how else would I know if it’s a good fit for Max’s and whether I think you’d like it?!? The show is so huge, and the chocolatiers and chocolate distributors are spread throughout the convention center. I used to think that that was confusing and, while it’s still is anything from straightforward, I have learned that the opportunity to sample a lentil chip or some humus in between chocolate bites is not only a nice break, it’s almost a necessity. People often tell me joke with me about what a “rough job” I have, but the truth of the matter is it really is hard to sample all this chocolate (cue the violins)! When you start at 10:00 in the morning and all you’re searching for is chocolate, it does not take long before both your flavor pallet and your stomach are overwhelmed and can’t decipher the differences between the options. One of the best ways to cut through the flavor characteristics of the samples is to take advantage of the coffee samples from the roasters exhibiting at the show. Before long, I find myself up to the brim with chocolate and coffee—wheeeeee!!!!!!! Having said all of this, I obviously have to admit that it really is fun to come shop for new chocolates. I’m excited about what I’ve tasted and what we’ve decided to bring to Max’s yet this year. Chocolate with coconut – coconut flakes, coconut milk, coconut sugar – it’s a huge trend and you’ll start seeing more of that in the store soon. I really can’t call sea salt chocolate a trend anymore, because it’s been around just too long to be a trend. I feel safe in saying it’s not going anywhere for the foreseeable future and has actually become quite common place. Don’t misunderstand that for me saying that I don’t like it – I actually love it! – it’s just that it’s not terribly unique anymore. The purity of food – in all categories, not just chocolate – continues to be a real focus. Non-GMO, allergen free, gluten free (which is also so mainstream and everywhere that it can hardly be called a trend anymore) were features that were heavily promoted by vendors in many food categories. Nut milks were big — I loved the macadamia milk! Healthy snacks are also huge–I sampled quite a bit of fruit bites, dried fruit, puffed fruit, crackers made with rice, quinoa, kale — you get the point. Those of you who know me well know that this is a big deal for me – both because of my own food sensitivities/intolerances and a strong personal need to focus on ingredients, but also because I feel that it’s important to you and it’s an issue of credibility. One of my pet peeves is when I find milk powder in dark chocolate. I get it when there is an inclusion in the dark chocolate – then all bets are off when it comes to some additives — but unless chocolate is labeled as a dark milk, I don’t understand why there is any milk in dark chocolate…?? ?